And we will all go down together! Every year since 2010, I've written the Houston Texans season preview for the print edition of the Houston Press, and while I've never been further off on a prediction for the final won-loss record than I was in 2013, I don't think I could have been more spot-on with what the determining factor would be for this team. Virtually the entire piece broke down the Matt Schaub/Gary Kubiak Era in great detail, and how, inexplicably, without any real degree of team accomplishment, somehow the Schaub-Kubiak combination had managed to stick around collectively long enough and start enough games together to become one of the five most tenured, active combinations in the league. Needless to say, the other combinations in the top five were far more accomplished than that of the Texans, each with as many or more Super Bowl appearances than Schaub/Kubiak had playoff wins. 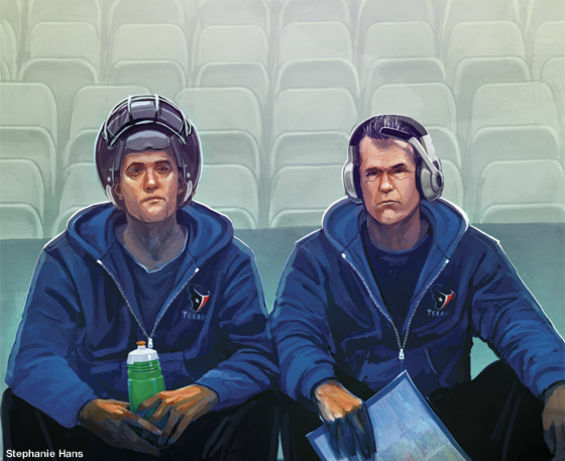 Hell, even the cover of the issue was a bit of grim foreshadowing, satirically depicting Schaub and Kubiak as a football version of Jesse and Walter from Breaking Bad. Appropriate, considering how it ended for Walt. Gary Lubiak loves Matt Schaub, Matt Schaub loves Gary Kubiak, and Bob McNair loved both of them for way too long. Patience is a virtue, unless it completely cripples your NFL franchise, and make no mistake, Bob McNair's patience with Gary Kubiak as a mediocre NFL head coach will be looked back upon as one of his most egregious errors as an owner, especially if this next era's hire is weak and Rick Smith bungles this upcoming draft. Bob McNair should have used this horrific abortion of a season as a chance to clean out the stench of the late '90s Denver Broncos once and for all and to put the late '90s Denver dog to sleep (which, at around 15 years old, happens to dogs at that age). He could have cleared out Kubiak and Smith, and he could have replaced it with a purebred dog of Green Bay, New England or Seattle descent. Instead, the next era is destined to be one of those pathetic, splotchy-haired mutt dogs, a hybrid of '90s Denver with some handpicked Smith puppet at head coach and God knows what with their first-round pick. One thing we do know with near certainty -- you won't have Matt Schaub to kick around and burn his jersey and harass in his driveway and cheer when he's injured anymore. He and his $14 million cap slot will be gone, with only the stench of $10.5 million in dead money and one playoff victory over Cincinnati at home as his football legacy. Bob McNair was exercising patience with Gary Kubiak. Whatever it was Kubiak was exercising with Schaub was far more weird, with the relationship evolving into more of a "mother defending her cubs" dynamic than a mentor/teacher thing, at least publicly. Ultimately, it became clear that Kubiak's addiction to reinserting Schaub into games after he had been benched for Case Keenum, and Kubiak's overly warped impression of what exactly Schaub is as a quarterback is what triggered McNair's pink slip for Kubes.